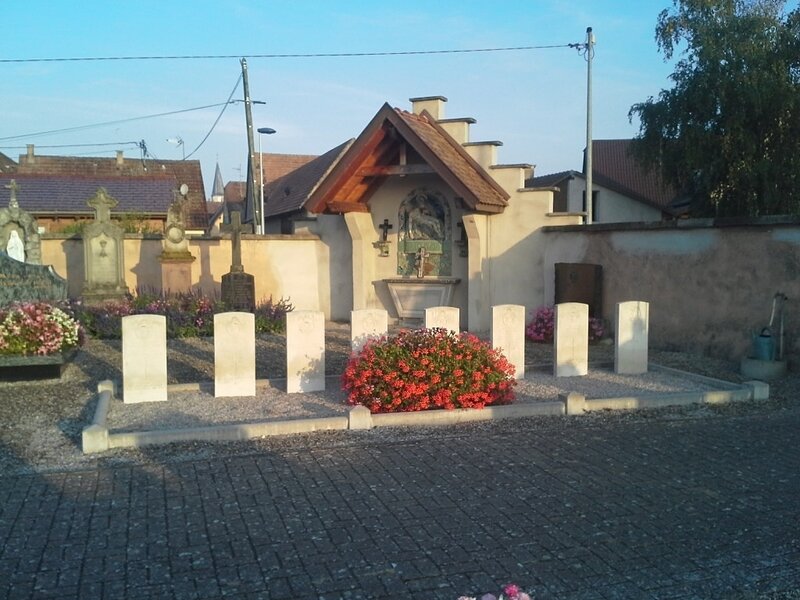 Artolsheim is a village in the Department of the Bas-Rhin, some 45 kilometres south of Strasbourg and 12 kilometres east of Selestat, a town on the N. 83 road from Strasbourg to Colnar. The communal cemetery is on the south-eastern side of the village on a track leading to the neighbouring village of Schoenau. 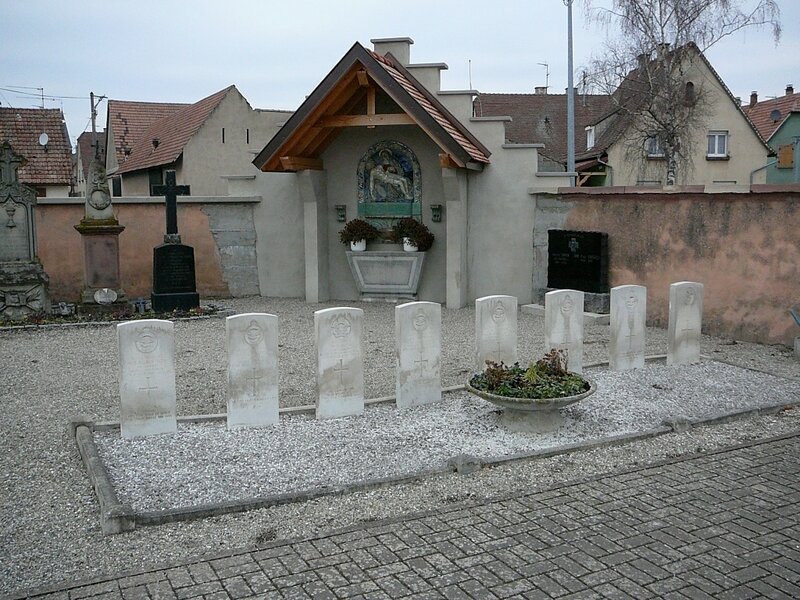 Historical Information: On the northern side of the cemetery are the graves of 7 airmen, 6 of whom belonged to the Royal Air Force and 1 to the Royal Canadian Air Force. 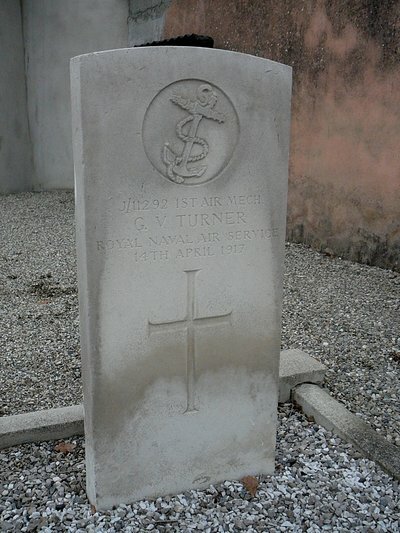 There is also 1 Commonwealth grave of the 1914-1918 war. J/11292 Air Mechanic 1st Class, G. V. Turner, Royal Naval Air Service, died 14th April 1917. Son of Mrs. J. Hobbs, of 1, Coleherne Terrace, Earls Court, London. 1461939 Sergeant John Neville Andrew, Navigator/Bomber in 550 Squadron, Royal Air Force Volunteer Reserve, died 15th March 1944, aged 22. Son of Neville John and Eva Marion Andrew, of Dartford, Kent. 42197 Flight Lieutenant Jack Simon Gustave Crawford, Pilot in 550 Squadron, Royal Air Force, died 15th March 1944, aged 23. Son of John and Aurelie J. Crawford; husband of Pauline May Crawford, of Harrow, Middlesex. 1393051 Sergeant William James Green, Wireless Operator/Air Gunner in 550 Squadron, Royal Air Force Volunteer Reserve, died 15th March 1944, aged 22. Son of James and Annie Rosita Green, of West Ham, Essex. 151370 Flying Officer Patrick Arthur Lockton, Navigator in 550 Squadron, Royal Air Force Volunteer Reserve, died 15th March 1944, aged 22. Son of Leslie and Marguerite Louise Lockton, of Glen Hills, Blaby, Leicestershire. J/86439 Pilot Officer William Victor Moss, Air Gunner in 550 Squadron, Royal Canadian Air Force, died 15th March 1944, aged 19. Son of Francis Edward and Edith Moss, of Galt, Ontario, Canada. 967233 Sergeant John Reginald Powell, Flight Engineer in 550 Squadron, Royal Air Force Volunteer Reserve, died 15th March 1944, aged 24. Son of Reginald Clifford Powell and Gwladys Anne Powell; husband of Hilda Marjorie Powell, of Morecambe, Lancashire. 1565912 Sergeant William Bertram Robertson, Air Gunner in 550 Squadron, Royal Air Force Volunteer Reserve, died 15th March 1944, aged 25. Son of John Robertson, and of Jessie Robertson, of Armadale, West Lothian.